On June 22, 2009 the domain sales service known as SitePoint split and changed their name to Flippa. Flippa's design is simplified compared to SitePoint although it still offers options to browse popular categories like established or premium websites. According to SitePoint, Flippa will offer a new search function that allows users to search for specific things such as minimum traffic. Flippa will also be featuring a statistics widget which will allow website shoppers to see quick stats about a particular site or domain such as the site's Google page rank or their uniques per month. The changes don't come without a hefty price tag, however. Flippa will also be introduced with a new fee structure more expensive than SitePoint's previous fee structure. 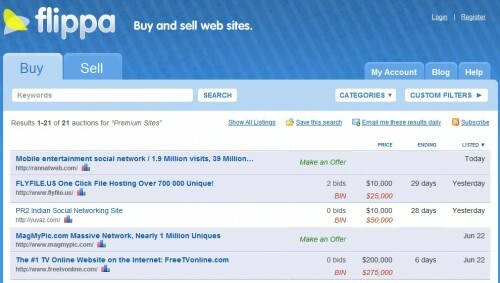 Flippa will be charging a "success fee" similar to eBay's final value fee. SitePoint has not yet announced whether or not they will be offering a marketplace for hosting, link sales, or scripts. User feedback made on SitePoint forums in regard to the change has been mostly negative. Many Twitter users are also spreading news of the change with retweets at the TechCrunch twitter account saying "SitePoint Spins Off Website Marketplace As Flippa, Upsets Users." SitePoint co-founder, Mark Harbottle commented, "If you want to come across to flippa and sell your site in the professional marketplace we’re creating for serious buyers, we welcome you with open arms. If not, please do go to digitalpoint. List your site for free and see if the old adage of “you get what you pay for” applies." This commented shocked and appalled many Digital Point users, many of which felt the remark by Mark Harbottle was "unprofessional" and that it was a "low blow" to the DigitalPoint.com webmaster community. I really loved the Sitepoint Marketplace. The main benefit (to other website selling forums) was a far better presentation of the sites sold there. It was however known as the “more expensive” site meaning that buyers usually paid a premium for the sites. Flippa is not a bad idea but I really do not like the way the auctions are displayed on the site. There are some additional quirks. I think I read somewhere that sellers can remove comments from their auctions which takes away one of the main selling points compared to eBay or Sedo. sitepoint users were usually quick to post interesting questions or raise concerns. Flippa, bad domain, logo and the whole design that i never seen on a professional well-known brand on the web. So go to Bido instead. Sitepoint was great in the day but it’s been years since I’ve gone there. Bido only gives you one domain a day, but it’s always a good domain. No “what ifs”.